Few games that I've seen benefit as much from being seen in video, as opposed to in stills, as PixelJunk Shooter. So before reading further, interested parties should watch the following — then read the words that follow. 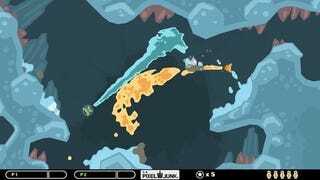 OK. See how that video does a much better job showing off the dynamic fluids of PixelJunk Shooter? Regular screenshots would just make this game look like a co-op 2D shooter that has you rescuing little guys in jumpsuits. But this game is more than a Choplifter/Defender homage. It's a physics game using liquids and many clever gameplay tricks. Let's put it this way: When Q-Games chief Dylan Cuthbert finished playing some co-op levels of the game with me at the Tokyo Game Show and referenced Yoshi's Island as a design model, it seemed neither hubristic nor inaccurate. What I've seen of Shooter shows a game full of good ideas, each confined to little more than a screen's worth of a discrete level. The basic moves involve flying through the level in a ship that can't be destroyed by impact against cave walls. You shoot missiles at bad guys and to break rock. Holding down the missile button generates an auto-firing fusillade of missiles, but it also begins to overheat your ship. The goal of each level is to rescue the men in suits by snatching them with your grappling hook, but letting a bunch of them die triggers a game over. The guys can die due to your missile fire or by being accidentally dunked or doused in lava. Poison gas kills them too, though water is not a hassle. Your ship can blow up from overheating, which happens not just when you fire too many missiles but when you fly too close to lava, poison gas or into magnetic liquid. To cool off, you can spin your ship with a swivel of the control stick, dunk your ship in water or collect floating gems. -The game's third of three worlds, following the previously seen volcanic and ice worlds, is an underground factory. In it is magnetic liquid that is drawn to your ship in a way that recalls, Cuthbert accurately referenced, the movement of the liquid creature in the 80s action movie, The Abyss. -Two players going through a level in co-op can exert enough gravitational pull on magnetic liquid to make it stand as a tower of goo. -Your ship in Shooter can don a "suit." Previously seen suits let you shoot streams of water or lava instead of missiles. Shooting water and lava creates rock (There's a particularly cool effect if players with the water and lava suits cross the streams). Spraying lava at gas, however, creates explosions. But spraying water at the magnetic liquid creates gas. You can imagine how a level might stack those elemental chains. -Sometimes gas floods a level, forcing the player to race to save a survivor before the cloud gets him. Spinning into the cloud dissipates it a little. -The magnetic liquid heats your ship on contact, but you can get a repulsor suit that lets you fly through the stuff, keeping it at bay around your ship. -There's a spider boss, and he's fun to fight. Trust me! Three bosses in all. -There's some sort of yin-yang suit that suddenly makes water heat you up and lava cool you off. I suggested it was an homage to Ikaruga. -Overall the game will have about 75 "scenes" spread across about five levels per world. Each that I played involved either a tricky battle or a devious environmental puzzle. Watch the second video to see the kind of stuff that was charming me. -The game's set for a December release, downlaodable to the PlayStation 3, at least in Japan. No U.S. date yet. Two player co-op is supported, which, Cuthbert told me, makes the enemies tougher.